Graduate students enjoy sharing their enthusiasm for nanotechnology! 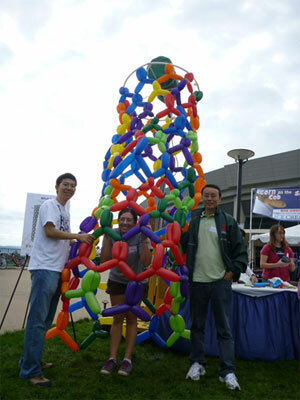 A colorful balloon model helps people to visualize the molecular structure of a carbon nanotube. Graduate students who participate in MRSEC research also engage in a variety of professional development, outreach, education, and community building activities. Graduate students engaged in MRSEC research projects are assigned to the Outreach Team of their choice that best supports their personal interests and professional goals for the academic year. Participation in Outreach Team activities is an expected and valued contribution to the Center's education and outreach mission, and a key element in the success of these programs. The voices of graduate students are important and valued. Representatives from each IRG and Outreach Team serve in a leadership role to provide a direct line of personal two-way communication with Center leadership, outreach, and admin staff. "MRSEC outreach has helped me come out of my shell as a communicator and leader. It allowed me to look at the broader impact of my research which I realized was invaluable for writing grants and proposals. Also, personally, it has made me better able to communicate with a wide variety of people and also developed my skills as a leader." "Outreach not only introduced STEM and what I work on to people unfamiliar with the field, it helped me learn how to present it to them so that they can fully understand it. That, and its fun." "The Penn State MRSEC has always put a heavy emphasis on its outreach program, and as a former active participant I greatly appreciate the personally rewarding experience. Not only did I get the opportunity to socialize with my peers at the university and those of all ages within the community, I have also practiced teaching sciences to a mixed audience, a skill immensely useful and critical for my current job: university faculty. And it was a lot of fun!" "Engagement in the education and outreach events of MRSEC has given me a unique opportunity to share the excitement of nanoscience with people beyond campus walls. As I work primarily with environmental application of carbon nanomaterials, this has also given me the chance to link my research to the need of real world and get feedback from the nonacademic community. Such discussions generate an enhanced sense of civic responsibility in me which is quite fulfilling. I got to think about technology transfer, economic issues and environmental concerns in a way that would be impossible in the confined laboratory workplace. Also, MRSEC outreach has given me an opportunity to develop "soft skills" such as interpersonal communication and leadership qualities. Being someone who wants to build a future career strongly focused in teaching, these are valuable skills to polish." Taking leadership roles within MRSEC outreach has given me valuable experience that I can draw from as I transition into a career in industry. "MRSEC outreach is a great way to improve science communication skills by engaging community members of all ages. Arts Fest is my favorite event because it utilizes a hierarchical mentoring system where graduate, undergraduate and high school students learn from each other as they prepare to communicate science activities to young visitors." "MRSEC outreach has given me the opportunity to work in a group effectively and also shown me ways to explain scientific facts with fun models to kids and adults."